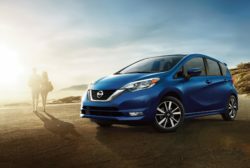 Nissan today announced U.S. pricing for the 2019 Nissan Versa Note hatchback, which is on sale now at Nissan dealers nationwide. The Versa Note’s sporty hatchback design, which differentiates it from the Versa sedan, offers an added level of style to go with a hatchback’s 5-door utility. Versa Note’s popular forward-looking front end features a “V-Motion” grille that flows seamlessly with the swept-back halogen headlights, sharing a family resemblance with Nissan Sentra, Altima and Maxima. The roomy five-passenger Versa Note cabin provides a spacious total interior volume of 112.9 cubic feet and ample cargo space of 18.8 cubic feet. The interior also offers front headroom of 40.8 inches and rear legroom of 38.3 inches – making Versa Note both adult comfortable and kid friendly.